Affordable and professional accommodation at the heart of Sheffield City Centre. An above average Holiday Inn Express. This fast and efficient chain hotel enjoys a central location on Blonk Street. And because there is something enormously satisfying about the word ‘blonk’ Room4u would be quite willing to recommend it on that basis alone. But it satisfies in other ways too; it’s cheery, affordable and guests even get complimentary use of the leisure facilities at its neighbouring sister-hotel. The prosperous quayside location on the River Don lend a swish and executive atmosphere and the hotel couldn’t be better placed for commercial and business interests. 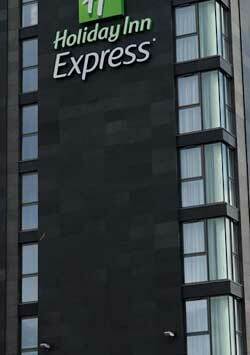 If you need a hotel that is fast, efficient and professional then the Express offers some of the best value for money . The air-conditioned rooms each feature a flat-screen satellite TV with pay movies, a seating area and free wireless Internet. For shopping weekends at Meadowhall, trips to Magna Science Centre or events at Sheffield Arena, it’s difficult to beat. All guests have free use of fitness room and sauna at the adjacent Holiday Inn Royal Victoria.